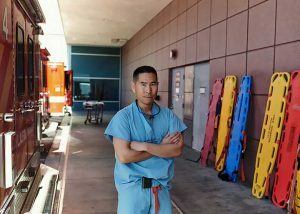 Kenji Inaba is a trauma surgeon at Los Angeles County General Hospital and director of the surgical intensive care unit. He’s also a sworn reserve police officer, part of a two-man patrol in the Rampart Division of the Los Angeles Police Department. Between policing and doing emergency surgery, he gets a lot of exposure to gunshot wounds, both entry and exit — how people get shot, and how they get better. In his police car he has a bag with basic medical emergency equipment, along with something that’s not so basic — a syringe called Xstat that is full of tiny, absorbent sponges to stop the bleeding from a gunshot wound. It’s one of several new and almost-new pieces of technology that can keep a shooting from becoming a murder. We rivet our attention on guns when a mass shooting occurs. But those shootings make up only a tiny fraction of homicides. As for the rest, they are concentrated among young men of color. The gun death rate among white males is 17 per 100,000, with a vast majority suicides. For black males the numbers are 34 per 100,000, with a vast majority homicides. For black males between 20 and 29, the rate is 89 per 100,000. Many grand reforms could help lower those statistics by addressing policing strategies, gun policies, institutional racism, police-community relations and the economic fortunes of poor neighborhoods. But technology can also make a difference. Most gunshot victims die of blood loss. Xstat is a new product that can stop the bleeding from penetrating wounds — from guns, knives, shrapnel, whatever — that are narrow and deep. It’s especially useful for wounds in the hip or shoulder, where tourniquets cannot be applied. Xstat’s sponges instantly absorb the blood and expand to put pressure on the wound. They’re physically tagged with a marker that will show up on an X-ray so that doctors can check that they were all removed. Xstat was designed for and first used by the military. Will Fox, a spokesman for RevMedx, the company that makes Xstat, said that all United States Army Special Forces and Ranger medics carry two types of syringes — a fat tube version designed for exit wounds from high-velocity automatic weapons and a thin tube version, which works for entrance and other small wounds and is more appropriate for civilian use. RevMedx is also working on a version for postpartum hemorrhage, the leading cause of maternal deaths. Fox said that medical personnel in about 15 cities carry Xstat in their ambulances or employ it in trauma centers. Inaba, who has yet another job, as vice chairman of the Department of Surgery at the University of Southern California, is doing the first study of its use on civilians. (He has no ties to RevMedx.) He hasn’t used Xstat yet while out on patrol — he hasn’t seen appropriate wounds — but he and his team have used it 14 times in the hospital. Another issue is price. A tourniquet costs $27 and can be used repeatedly. Fox said the price of the small Xstat is now $80, down from $120 — and it’s not reusable. Xstat is one of several innovative products that stop bleeding. The British company Celox Medical makes granules and gauzes impregnated with chitosan, made from shells of shrimp and crabs. They form an effective emergency plug when packed or poured into a wound. They can be used for more kinds of wounds, on more places on the body, than Xstat. But they take longer to stop bleeding, the powder is hard to use anywhere there’s wind, and they aren’t good for treating gunshot wounds that spurt blood from a nicked artery or vein — a task Xstat can do. Speed matters for gunshot wounds. A slow response can mean not only that victims die, but also that evidence and eyewitnesses melt away. When people do make a call, it can be after precious minutes are lost to debate about whether what they heard was a gunshot. And callers often can give the police only the vaguest description of the direction the gunshot noise came from. So the police drive around the area. If they find nothing suspicious, they might sit in their car with the lights out for a while to see if anything happens. If they do happen upon a crime scene, of course, they will be going in blind, which is always dangerous. What could help is technology that instantly reports gunshots and their location. In fact, it already exists and is provided by a company called ShotSpotter. More than 85 American cities and Cape Town, South Africa, use it — some across the entire city, many just in high-crime areas. New York City has 57 square miles covered by ShotSpotter. Cities lease the technology and services, and the company puts up acoustic sensors on buildings and lampposts. They can pinpoint the location of a shot by how fast the sound reaches different sensors. Machine algorithms and then a panel of human acoustics analysts sitting in California look at the sound patterns and determine whether it’s gunfire — and if so, how many shots and whether automatic weapons are involved. The police get the audio file and location, to within 27 yards, on their cellphones or car computers within 45 seconds of a shot. ShotSpotter has critics. It is expensive — $65,000 to $85,000 per square mile of coverage. (Some cities get Justice Department or other federal grants to pay for it.) Before 2011, computers made the determinations alone, and often mislabeled other noises as gunshots. But since humans entered the process, it has become much more accurate. It’s easy to see how ShotSpotter could save victims by providing paramedics with faster and more accurate location reports. But how — and even whether — ShotSpotter also reduces shootings hasn’t been proved. “There haven’t been any rigorous studies of the impact of ShotSpotter,” said Jennifer Doleac, an assistant professor of public policy and economics at the University of Virginia. One reason is the company goes to extraordinary lengths to keep cities from releasing their ShotSpotter data. Some cities have seen large decreases in shootings after using it, but they are often making other changes as well, and it’s hard to say what role ShotSpotter played. The company points out that since 2011, about 10 times more cities have expanded their ShotSpotter coverage than have ended it. One way the technology could reduce crime is by giving police accurate data. If a police department knows the number, location and time of shootings, it can test crime-control measures: Did the night basketball program reduce shootings? Also, the police can focus their resources: Once it’s known that a particular corner has lots of gunfire at midnight on Fridays, they can better patrol it. Hartford is planning to send not just police officers and paramedics to the scenes of shootings but — as soon as the area is secure — therapists as well, to work with children who heard or saw the shooting. Having the audio file and an exact location also tells the police more about what they’re walking into, which keeps them safer. Foley believes that ShotSpotter has helped Hartford’s police to solve crimes; the clearance rate has jumped to 65 or 70 percent from 35 to 40 percent, he said. “We’ve done more than use the tech, but it’s absolutely helped,” he said. ShotSpotter’s audio files are admissible in court. If a city has video cameras, the sensors can activate and point them. The location accuracy allows the police to get out of their car and look at a small area. That way they have a better chance of finding shell casings, which can tie the shooting to a specific gun. The technology can also strengthen the relationship between the police and the community. All those unreported shootings? Local people don’t know they’re unreported. They will just assume that the police didn’t show because they didn’t care. And that helps to normalize gunfire. “That has all kinds of bad consequences,” said Ralph Clark, ShotSpotter’s chief executive. Tina Rosenberg won a Pulitzer Prize for her book ”The Haunted Land: Facing Europe’s Ghosts After Communism.“ She is a former editorial writer for The Times and the author, most recently, of “Join the Club: How Peer Pressure Can Transform the World” and the World War II spy story e-book “D for Deception.” She is a co-founder of the Solutions Journalism Network, which supports rigorous reporting about responses to social problems.